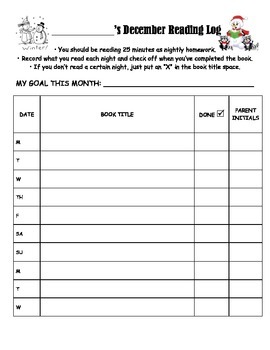 Looking for an easy way to keep track of students' nightly reading? 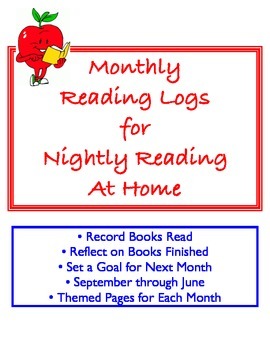 These fun themed monthly logs are easy for students and parents to use. Space included to record book titles read each night, a space for a checkmark when a book is finished, and spot for parent initials. 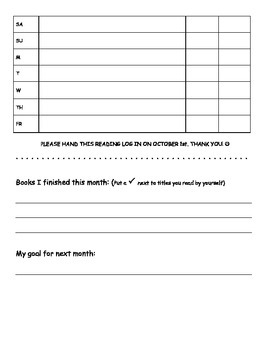 Students hold on to the logs - keep them in their homework folder, assignment book, or use as a bookmark - until the end of the month. 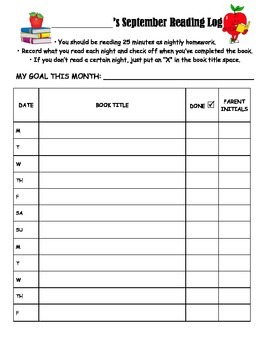 There is a place at the end of each month to list books finished and to set a goal for the next month. September through June are included. The days of the week are listed, students (or you could on your master) pencil in the dates. Each month is two pages (but easily copied front-to-back).